Found on 28 September 1987, somewhere on lower Manhattan Island, New York, New York, while I was the first Canadian curatorial intern at the New Museum of Contemporary Art, on Broadway, and was living in the NSCAD loft on Walker Street. Some lost books . . .
Lady Franklin's Revenge, Ken McGoogan (hard cover, autographed and dedicated to me @ a BookExpo Canada signing). New Sufi Songs and Dances, Carol Ann Sokoloff (autographed & dedicated to me @ BookExpo 2002). Between Families and the Sky (Goose Lane), Alan Cumyn. Man of Bone, Alan Cumyn. A Woman Alone on the Atikokan Highway (Wolsak and Wynn), Jeanette Lynes. Left Field (Wolsak and Wynn), Jeanette Lynes. The Hero with a Thousand Faces, Joseph Campbell. The Memory Orchard (Brick Books), Tim Bowling. Going Down Goose Lane Toward Broken Jaw: Fredericton poems & stories (Harmonia press), Wayne Ray. Lifedream (Guernica), Herménégilde Chiasson, translated by Jo-Anne Elder. A demo cassette by the Crossroads Cant poetry group: Shafiq, Ann Shin, Mark Seabrook, Zaffi Gousopoulos, & Mary Elizabeth Grace. 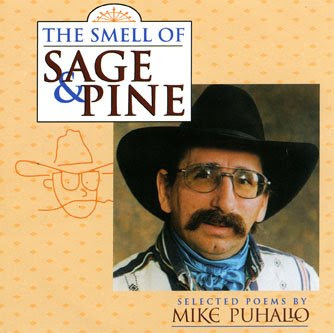 The Smell of Sage & Pine: Selected poems by Mike Puhallo (1998). E. Russell Smith in the River Readings series, Fredericton, NB, on 21 October 1998. Found Saturday afternoon, 16 April 2009, on the tread of a basement stairwell in the Charlotte Street Arts Centre, 732 Charlotte Street, Fredericton, NB, during a break in and Emergency First-Aid course being led by Paul Angers in the NB Filmmakers' Co-operatives workshop series. 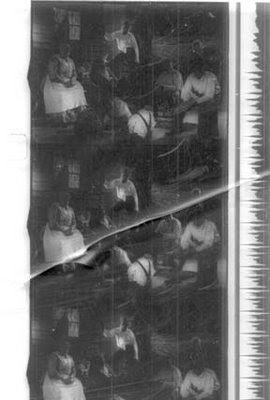 Don't know what film this snippet is was edited from but someone else likely knows . . .
Fredericton Poets! Bring a poem of yours to read today! Viernes 15 a las 17.00 hrs. Organiza: Nela Rio, Directora Grupo Fredericton de Academia Iberoamericana de Poesía; Asociación Latina de New Brunswick; Broken Jaw Press. Fredericton will participate in the Word in the World III reading. Poets are asked to bring a poem of theirs to read. We will meet on the steps of the Beaverbrook Art Gallery, at 5:00pm on Friday, May 15th. Por favor noten que Fredericton va a participar en el III Festival Palabra en el mundo. Nos encontraremos en los escalones de entrada de la Beaverbrook Art Gallery a las 5 de la tarde, viernes 15 de mayo. Found 10:30 AM, 9 April 2009, in the parking lot of the burnt 200 York Street, Fredericton, NB, apartment building that had been my home for almost 11 years. 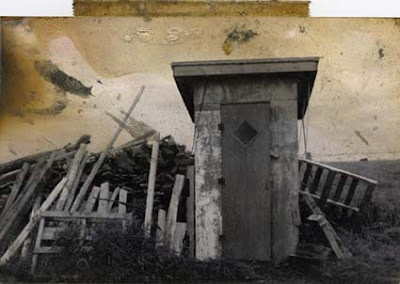 The photo of an outhouse and other paper scraps was with some fire-charred wood on the pile of parking lot snow. Found photo of 9:17 AM, 8 April 2009, on Regent Street, Fredericton, NB, on the hill beside the skinny parkette. 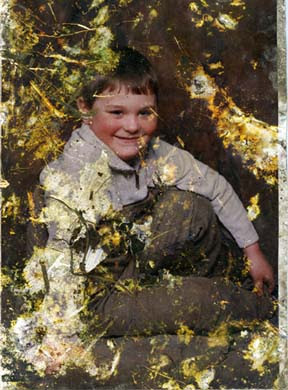 It's a seriously scuffed-up studio portrait of a young boy. Ashes, Paper & Beans on CHSR 97.9 FM, Fredericton. Show featured an recorded interview with Sackville, NB, poet Marilyn Lerch conducted by Linda Rae Dornan (CHMA, Sackville) and my 1998 recording of Tess Fragoulis reading her short story "Some Distinguishing Mark" at Gallery ConneXion. "Land & Liberty" by Zach de la Rocha. Live interview with artist Immony Men on his exhibition/installation Effections showing May 2 to June 13, 2009 through Gallery ConneXion (graciously hosted by the Beaverbrook Art Gallery in the lower level gallery at 703 Queen Street, Fredericton NB). "A Text for One voice" by Ottawa's Max Middle. 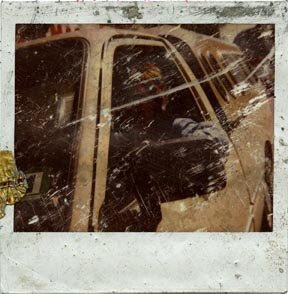 sound: Neil Young "peace of Mind"